Our range of fun gifts under £10 includes something for every personality type, from the foodies to the millennials and even the Harry Potter lovers! When it comes to Christmas gifts, we Brits love to splash out as we get into the festive spirit. A survey by Deloitte found that the UK spends more than any other European nation surveyed on gifts*. In fact, according to the Bank of England, a typical UK household spends over £500 extra in December**. However, despite our propensity to splurge during the festive period, it can be hard to find that extra bit of cash for the little gifts. Secret Santa’s a great way to save money between friendship groups or liven up the office atmosphere, but after spending most of our cash on our families, we often don’t have much to spare. 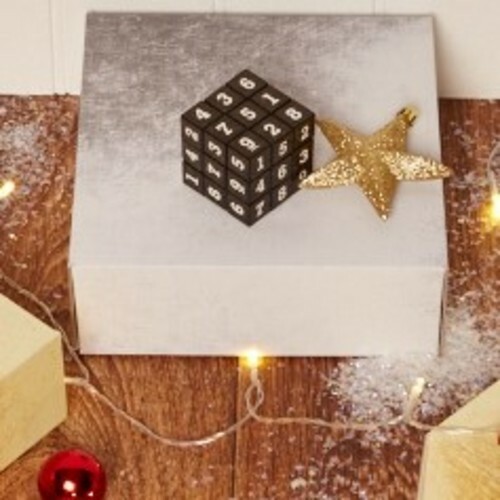 Leading high street retailer Robert Dyas has a whole host of low-cost gifts for your friends or workmates — all under £10 with some even coming in at under £5, and a ‘3 for 2’ offer on all of them. And if you’ve pulled a name out of the hat but have no idea what to buy, they’ve got heaps of inspiration to help you choose. Forget giving a muggle gift to the Harry Potter fan — give magical gifts instead. 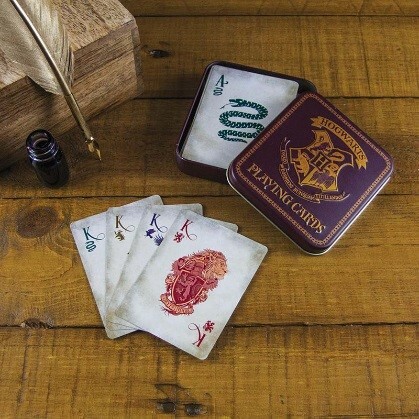 They’ll love these Hogwarts Playing cards (£6.99) and Winning Moves Harry Potter Trivial Pursuit (£9.99). If the person you’re buying for will be the first to get the shots in at the Christmas party, this game of Drinking Roulette (£9.99) will go down a treat. Mix cookery and Christmas and what do you get? This fun Paladone Elf Apron (£7.99! Perfect for anyone who loves to bake or cook. Anyone who grew up in the 90s will love Gift Republic Totally 90’s Trivia (£4.99). It’s full of fun quiz questions on everything from The Fresh Prince of Bel-Air to Britney Spears. For the person who likes nothing better than a glass of Prosecco on a Friday night, this Prosecco Lolly (£3.99) makes a great gift. Alternatively, you could give them this Blue Sky Sudios Pop-Up Prosecco Glass (£5.99), so they’re always ready in times of need! 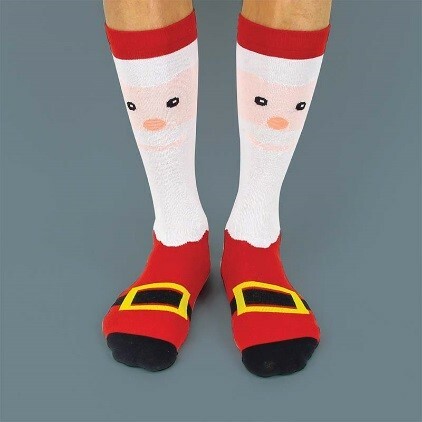 If your Secret Santa recipient loves a lively pair of socks to cheer up their workwear, give them a Christmas pair like these Paladone Festive Socks (£4.99). Rose gold homeware is a trend that some just can’t get enough of. This Cinematic Light Box (£8.99) is a great way to light up their Christmas. If they can’t resist a flutter every now and then, this Mini Slot Machine (£9.99) makes a fun gift. They simply put coins in and when they’re lucky, they’ll hit the jackpot. It even doubles up as a piggy bank to keep on their desk. Perfect for the commute or when they’re just a little bored, this Sudoku Puzzle Cube (£3.99) will keep them occupied and entertained. Give the gift of family fun to your colleague with kids. Whether it’s The Chase, Catchphrase or Family Fortunes, these Ginger Fox card games (all £5.99) are sure to be appreciated. To those who love lager, give this novelty Lager Lolly (£3.99). Completely hangover-free, it’s bound to put a smile on their face. If your workmate loves to clean and their desk is always spotless, the Henry Microfibre Screen Cleaner (£5.99) makes a great gift. If the person you’re buying for loves a bit of sparkle and fantasy, this Unicorn Mood Light (£7.99) ideal, as is this fun Paladone Unicorn Hoopla set (£6.99). This Stress Cactus (£3.99) is perfect for placing on desks ready to be squeezed in times of stress or boredom! Got a friend who’s always on their bike or a colleague that cycles to work? Keep them safe and sound with a Colour Changing Spoke Light (£3.99). If they play golf, these Thumbs Up Golf Ball Glasses (£7.99) will save them hours looking for those wayward little balls. Give your best mate in the office something fun to do when they have a few minutes to spare! These Thumbs Up desktop games - table tennis, football and curling,(all £6.99) are great fun to play together when the boss isn’t looking. For more information please visit the Robert Dyas website at http://www.robertdyas.co.uk. This press release was distributed by ResponseSource Press Release Wire on behalf of Robert Dyas in the following categories: Children & Teenagers, Men's Interest, Entertainment & Arts, Leisure & Hobbies, Home & Garden, Women's Interest & Beauty, Environment & Nature, Consumer Technology, Food & Drink, Media & Marketing, Retail & Fashion, for more information visit https://pressreleasewire.responsesource.com/about.